Reality Television has slowly moved away from humiliating competitions towards following the private lives of pseudo-celebrities so before it starts My Little Eye feels dated. It doesn’t help that it relies heavily on technology that has been clearly updated, down to the sound of a dial-up connection to help make the link to the internet playing a central part in the movie’s plot. All of this could be forgiven if the movie played to it’s strengths and took advantage of the great potential idea at it’s core. The movie is about five strangers placed together to spend 6 months in an isolated location. If they leave the location or it’s wider grounds for longer than 24 hours then they lose out on a million dollar prize money. The competition is being watched on the internet via cameras in every room. The potential for where this story goes seems endless. This is where the movie keeps your interest. There are some great ideas here as each of the characters are slowly picked at and chipped away. Reasons to leave the house are discovered and decisions as to whether the game is real or these people are being played are also explored. At times the movie can be brilliantly tense, from messages scrawled randomly on mirrors to packages containing twisted items to rile up a reaction between the competitors. The competitors themselves fall just shy of a host of paint-by-numbers cliches. There is the mysterious handsome one (Sean CW Johnson), the bizarre nerd (Stephen O’Reilly), the edgy creep (Kris Lemche), the promiscuous live-wire (Jennifer Sky) and the uptight innocent (Laura Regan). It makes for some interesting dynamics and the scenes where their pasts start to come into play make for some of the better aspects of the movie. As the week goes on, the story begins to intensify. There is a very good mystery at the centre of the events, with the contestants slowly trying to unpick what is actually happening to them. The direction it goes in is also as dark as you would hope although with a tease and a build as good as this, it is a shame that the finale falls flat. The revelation of what is actually happening and the eventual outcome doesn’t match what has gone before. It makes sense but doesn’t satisfy considering the potential of what the overall resolution could have been. There are a lot of good ideas here but it fails to deliver something as unique as the initial concept. 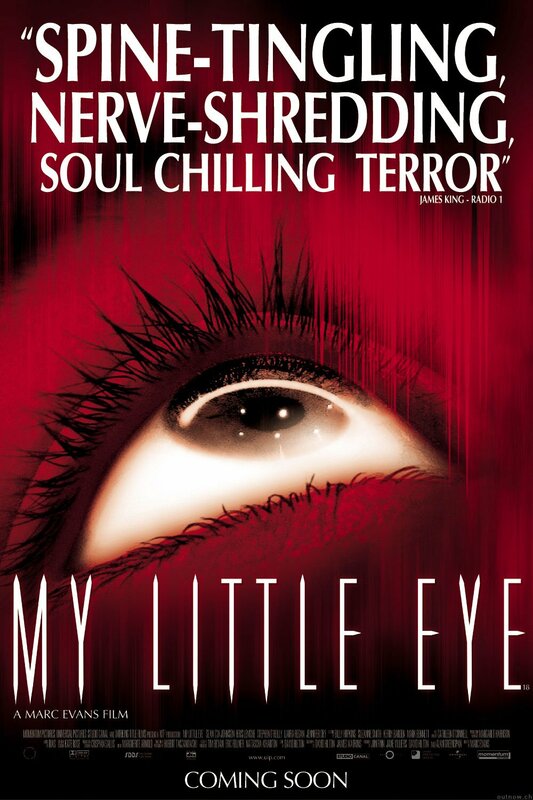 Overall, My Little Eye feels dated from the beginning but has a great plot to hinge a fairly scary movie upon. Unfortunately, as good as some of the plot strands and concepts are, it never reaches it’s full potential and suffers from a mediocre and disappointing ending. I would love for there to be a reality tv show that is NEVER broadcast, so the contestants, upon release, experience a totally different life than they thought they were going to have. If they ever do become successful or famous in the future, then the footage from inside the house will be like gold. That is true. Imagine the rage from the contestants who believed they would be famous and it was all for nothing!